The early part of the week is dominated by a New Moon that forms a yod with Pluto in Capricorn and Neptune in Pisces. We face a critically important decision as this new cycle starts, and no matter which choice we make we will always wonder what would have happened had we chosen the other path. 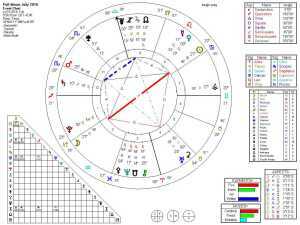 Mars enters Sagittarius a few hours before the New Moon perfects, and we feel a major shift. Wednesday finds perfection of a series of aspects that confirm the power and important of this yod (decision(s)). The last full week of July is likely dominated by the Uranus stationary retrograde (SRx) that perfects Friday afternoon. We feel it all week, and chances are good we felt it some last week as well. Surprises, maybe dangerous ones, dominate the week. Revolutions are attempted but surely fail. A peppering of quintiles gives us some good ideas, but they will almost certainly need revisions and adjustments. Write them down and keep them for later. We will have more to say about this FM as it approaches perfection, but you need to know now that this indicates we are in a window of rare and powerful importance. Diamond patterns are rare, and we had one on the Winter’s Solstice of 2012 (when many people predicted the end of the world). We are not at the “end of the world,” but we (collectively) are facing major change, and this diamond patter confirms that.